Sukiyaki Time! [recipe] – Cin Cin, Let's Eat! My grandparents grew up in a time when Japan colonized Taiwan. Therefore, they are fluent in Japanese and most of their friends are too. It’s no wonder that Japanese cuisine and culture were introduced to me when I was very young. Lots of my grandparents’ friends who resided in Japan often shipped us sweets, rice cracker snacks, and regional specialties from Japan. Sometimes we received the famous Japanese white peaches, Fuji apples, Rainier cherries, and honeydew melons. These varieties were not widely available in Taiwan at the time, so we treated them like treasures and savored every bite of ’em! Some of my fondest childhood memories were of unwrapping all the delicate and fancy wrappers and saved them for origami paper. Anyway, I digressed. But you can see where my strong affinity for Japanese cuisine came from. Sukiyaki is one of my favorite home-cooked style dish. Japanese cuisine is not all about sushi rolls and sashimi. In fact, those specialty rolls you see in Japanese restaurants here were probably invented to cater to the Western tastebuds. A simple traditional home-cooked meal consists of rice or noodle, miso soup, stewed or braised meat with potatoes and daikon, tofu, pickled vegetables, fried fish-paste cake…etc. 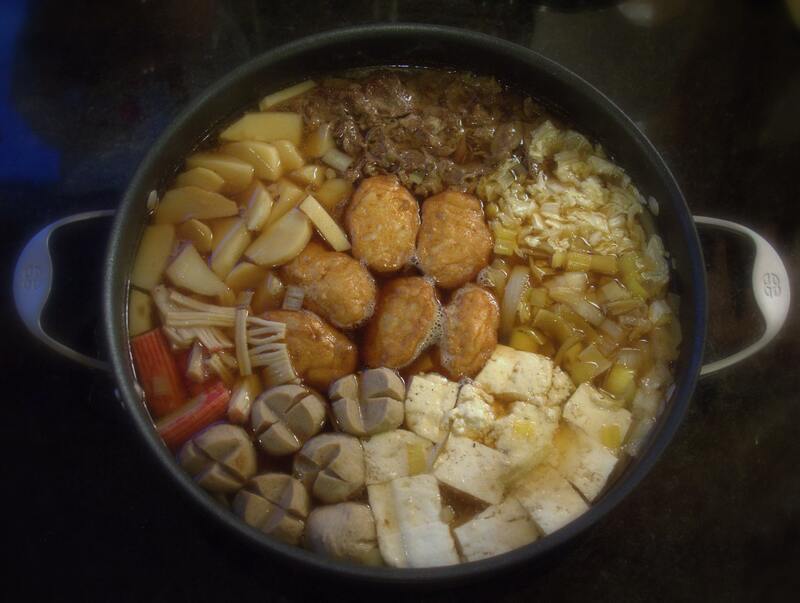 Sukiyaki is a common winter dish. 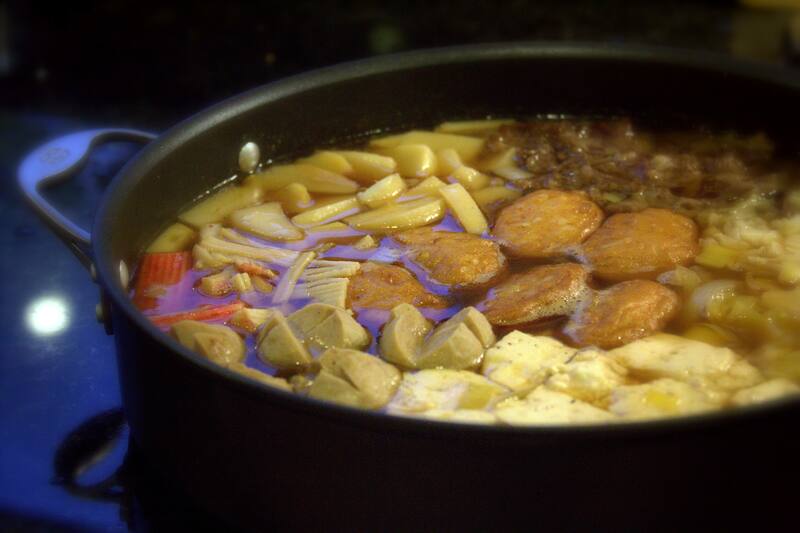 It’s a style of hot pot, and different regions have their own distinct ways to cook this dish. It’s perfect for the weather we’ve been having, and so easy to make. 1 box tofu, cut into cubes. Heat 1-2 tbsp of oil in the skillet, brown the meat. add 1/2 tbsp of sugar to the meat slowly. Once well-browned, set them to one corner of the pan. The sugar speeds up the burning process, so keep a close eye and don’t burn the meat. Add the rest of the vegetable, tofu, and noodles to the pan. Arrange them so that they don’t mix. Add all the sauce ingredients. Close the lid and bring to a boil. Once boiling, wait a couple of minutes then uncover. Make sure the ingredients on top are getting cooked. Cook for another 2-3 minutes. Optional – For dipping: try ponzu sauce (citrus soy), or a pasteurized beaten egg. In the picture, you can see that I omitted some ingredients because I didn’t have them on hand. Instead I added sliced bamboo shoots, Taiwanese pork meatballs, sliced leeks, imitation crab, fish cake with tofu and veggies. You can add whatever you feel like! The most important ingredients to me, are the meat, scallion, tofu, and cabbage. So if one of the ingredient is missing, I make sure to find something of equal to subtitute, for example – use leek and onion to substitute scallions. I also like my sukiyaki very soupy. I know, it’s not really authentic to do so, but I love drinking the broth so I always make sure that the soup is not too salty or sweet by adding more water or stock then what the recipe called. Dang I should know not to read posts first thing in the morning… man looks so good I want it now!! !